There are 31 Assisted Living Facilities in the Land O' Lakes area, with 2 in Land O' Lakes and 29 nearby. The average cost of assisted living in Land O' Lakes is $4,100 per month. This is higher than the national median of $3,346. Cheaper nearby regions include Lutz with an average starting cost of $3,173. To help you with your search, browse the 220 reviews below for assisted living facilities in Land O' Lakes. On average, consumers rate assisted living in Land O' Lakes 3.8 out of 5 stars. Better rated regions include Lutz with an average rating of 4.2 out of 5 stars. Caring.com has helped thousands of families find high-quality senior care. To speak with one of our Family Advisors about assisted living options and costs in Land O' Lakes, call (855) 863-8283. Land O’Lakes, located in central Florida’s Pasco County, is home to nearly 32,000 people. This community has a large senior population, with almost 16 percent of residents being 65 or older. The area’s seniors have many assisted living facilities to choose from. There are 31 facilities located in Land O’ Lakes and surrounding areas. Assisted living facilities in Land O’ Lakes are regulated by the Florida Agency for Health Care Administration (AHCA). The state’s assisted living facilities provide routine personal care and medication assistance to seniors, and licensed facilities may be home to one or more residents. As in the rest of Florida, seniors in Land O’ Lakes don’t pay taxes on their Social Security income. Pension income is also exempt. This tax relief may be an important consideration for seniors who are considering relocating to Florida. The cost of living in Land O’ Lakes is 14 percent higher than the national average. This increase is mostly attributed to higher housing prices in the area. This may be an important consideration for seniors who live on a fixed income. Seniors in Land O’ Lakes can enjoy an average of 248 sunny days per year, which is much more than the national average of 205. The area’s winters are mild, with lows in the 40s, while summer highs can reach into the 90s. Land O’ Lakes has few facilities from which to choose in the event of a medical emergency or illness, with the nearest major hospital located in Tampa, Florida. The crime rate in Land O’ Lakes is lower than both the statewide and national averages. The small community is safer than 66 percent of American cities, which safety conscious seniors may appreciate. Land O’ Lakes offers limited arts and cultural attractions. Seniors can explore the community’s Olden Days Fine Arts Museum. Many attractions are available in Tampa, which is a short drive away from Land O’ Lakes. Assisted Living costs in Land O' Lakes start around $4,100 per month on average, while the nationwide average cost of assisted living is $4,000 per month, according to the latest figures from Genworth’s Cost of Care Survey. It’s important to note that assisted living rates in Land O' Lakes and the surrounding suburbs can vary widely based on factors such as location, the level of care needed, apartment size and the types of amenities offered at each community. 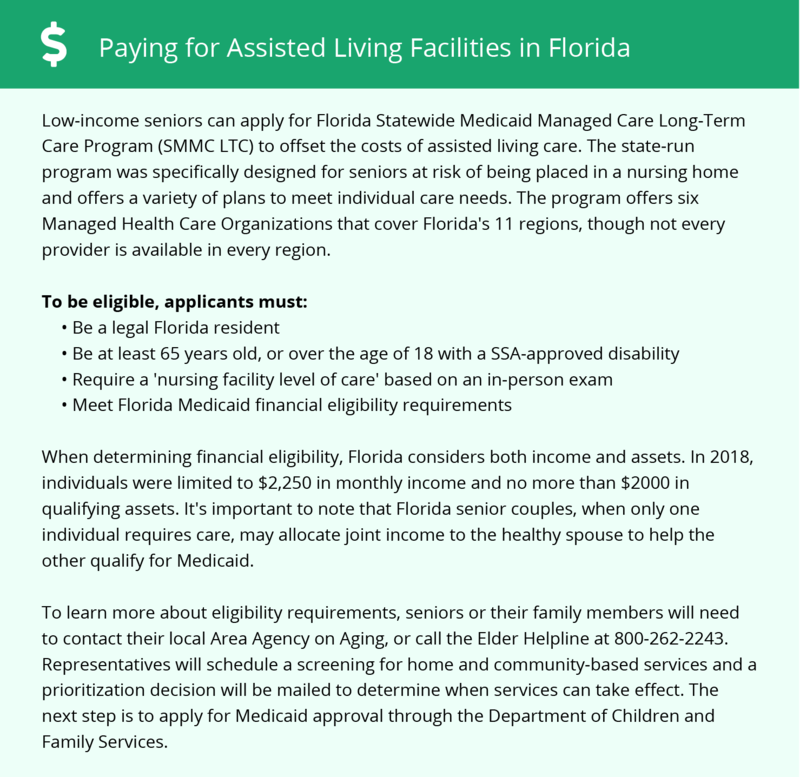 Seniors in Land O’ Lakes may be eligible for several forms of financial assistance. Medicaid recipients may be able to receive funding from Florida’s Statewide Medicaid Managed Care (SMMC) program. Seniors may also be eligible to receive funding from the optional state supplementation (OSS) program. Land O Lakes and the surrounding area are home to numerous government agencies and non-profit organizations offering help for seniors searching for or currently residing in an assisted living community. These organizations can also provide assistance in a number of other eldercare services such as geriatric care management, elder law advice, estate planning, finding home care and health and wellness programs. To see a list of free assisted living resources in Land O Lakes, please visit our Assisted Living in Florida page. Land O Lakes-area assisted living communities must adhere to the comprehensive set of state laws and regulations that all assisted living communities in Florida are required to follow. Visit our Assisted Living in Florida page for more information about these laws.